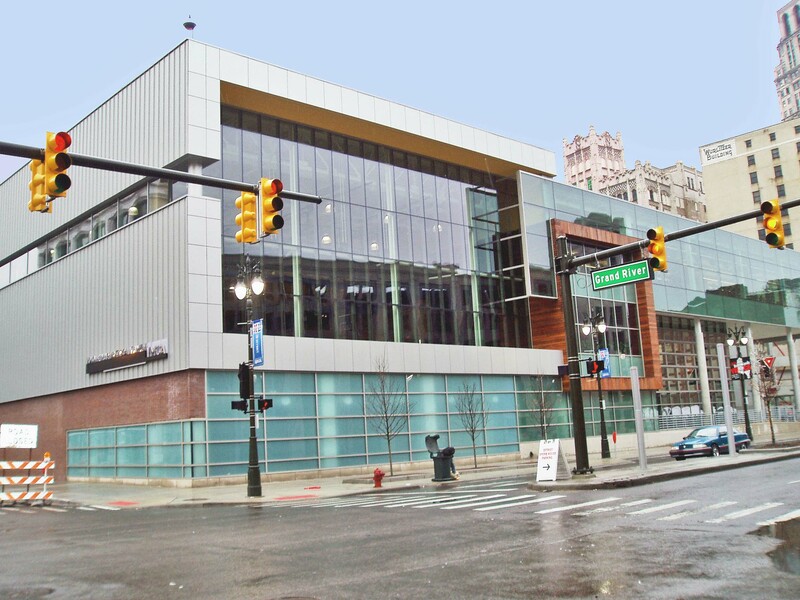 This building illustrates how local philanthropy plays an important role in the continuing revitalization of the Motor City. The first YMCA group in Detroit was organized in 1852, making the Y one of the oldest organizations in the city. By 1883 they commissioned George Mason and Zachariah Rice to design a substantial building at Griswold and Grand River on the west side of downtown. W. Hawkins Ferry, in his The Buildings of Detroit, mentions that the most interesting architectural feature was a Norman Romanesque entrance with a triple arch embellished by elaborating carved capitals. I am not sure when the YMCA moved out of that building at Griswold and Grand River, but a new structure was built in 1909 on Witherell between East Adams and East Elizabeth. This was a massive nine-story building with some classical touches, including arched windows at the upper level. That building was razed so that the new baseball park could be erected, meaning that downtown Detroit lacked a YMCA for about a decade. At the time the old building was torn down, there was an expectation that a new structure would appear. 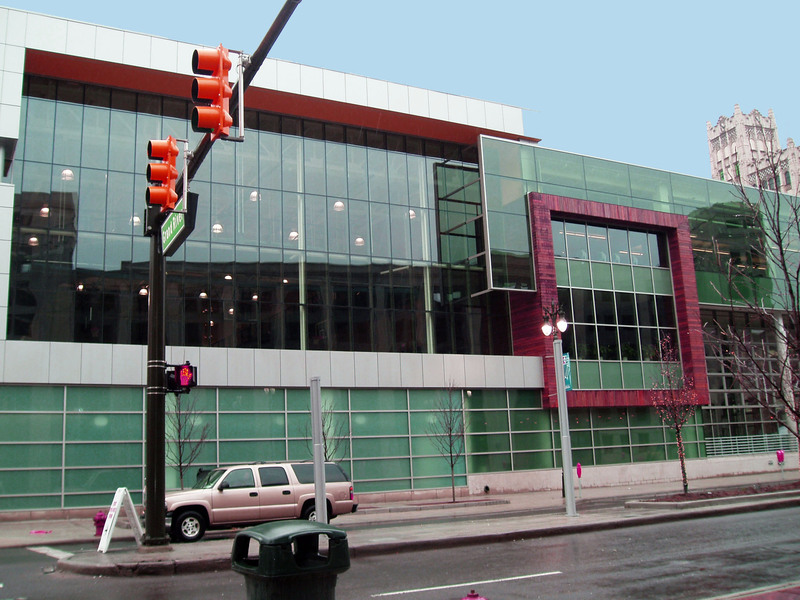 Ground on Broadway was broken in 2004, and finally in late 2005, the modern new YMCA that you see above was opened. Downtown Detroit is rapidly changing for the better. When the huge Hudson building was empty—along with most other nearby buildings on Woodward—the city’s center seemed empty and, perhaps, unfriendly at night. The opening of Comerica Park, the shift of GM’s offices to the Renaissance Center, and the new gambling casinos marked a turning point. After those events, the modernizing of old office buildings, including the Dime Building and the Guardian Building was followed by a large-scale conversion of other structures into condos and apartments. Many, perhaps most, of the remaining older buildings on Woodward between Campus Martius and Grand Circus Park are now, or soon will be, residences. It is pretty safe to bet that downtown Detroit and a broad corridor extending from downtown toward the New Center area will retain a large number of middle-class and professional jobs. An increasing number of young professionals—and some retirees—will likely live in the condominiums and apartments that are within walking distance of this new YMCA. The retirees may use the Y during the day, while the young professionals go there late in the afternoons and on the week-ends. The generosity of the Boll Family of Grosse Pointe Shores supported this magnificent new building. John Boll founded a contracting firm in the 1950s—the hylicon days of suburban growth. Later, he became a leader in creating developments for manufactured housing. He originally called his firm Chateau Estates. Eventually, his company became the largest such firm in the nation with 240 developments in 36 states and more than 100,000 units of manufactured housing. In 2003, John Boll’s company, then known as Chateau Communities, was purchased by the pension plan for State of Washington employees. They changed the name to Hometown America Communities. John Boll and his wife, Marlene, who trained to become a professional dancer, are very active in local philanthropy. This YMCA is, I believe, their most public contribution to the metropolis.